New Item!! Autism Angel Heart Enamel Brooch. 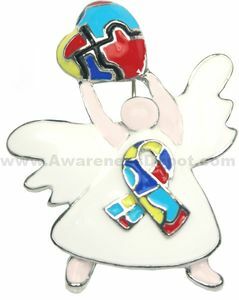 This Angel Brooch is a new take on our popular awareness angel. Each angel wears a cute white dress and wears a multi-colored autism ribbon over her heart and lifts a puzzle-piece heart over her head. This unique design is great for showing your love and support for someone with Autism. Measures 1 3/4" high x 1 1/4" wide. Each autism brooch is individually poly bagged.